When news of the Canon EOS 6D Mark II hit our desks, we knew we had to do another Day Out feature. We also knew we wanted to work on it with Daniel Tran and, luckily, he was just as keen to work with us. Growing up in Coffs Harbour, New South Wales, Daniel was surrounded by sprawling landscapes and big skies. With scenery like that, it’s hard not to be inspired. In fact, it’s one of the reasons he turned to photography in the first place; it gave him a way to capture and share the beauty of his environment with people near and far. For Daniel, it’s all about getting out there and finding something exceptional in the places around you. It’s about exploring new locations and revisiting old ones with fresh eyes. Perhaps most importantly, it’s about finding a way to reconnect with nature to remind ourselves that Earth is a pretty incredible place. 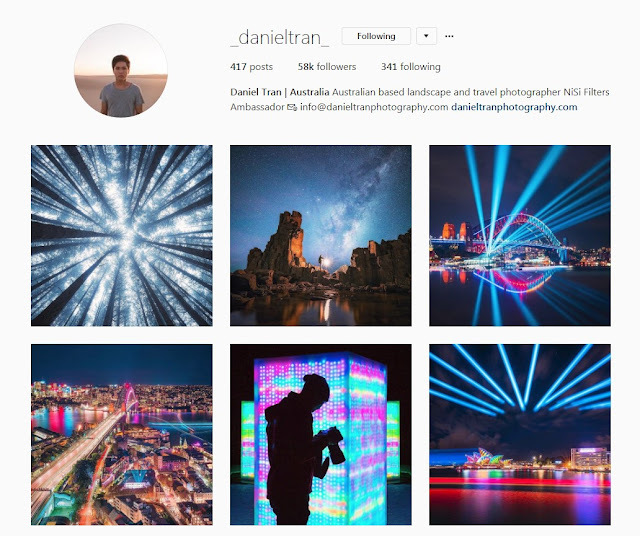 He’s been working professionally for the last year under Daniel Tran Photography, specialising in landscape and travel photos. A background in art has given him a sharp eye for detail and, with an impressive portfolio and carefully curated Instagram, it’s not surprising that Daniel expects his gear to stand out. That’s why we thought he’d be the perfect candidate for our next adventure. Check out Daniel’s Instagram for more amazing photos of cities, skies, and Mother Nature. The highly anticipated EOS 6D Mark II, with its brag-worthy low light capabilities and handy features like Bluetooth and a Vari-angle touchscreen (the first full frame DSLR to have both of these), was practically begging us to let it capture some epic sunset landscapes and astrophotography. While we weren’t exactly sure where to go, Daniel came to the rescue with somewhere spectacular in mind; The Boneyard Beach, a chilling name if I’ve ever heard one. It’s about an hour and a half south of Sydney in Kiama Downs, a beautiful, quiet coastal town. Perfect place for a road trip! We met at DCW HQ, packed up our gear, and carpooled down the motorway watching the skies and hoping the clouds would clear. Once we arrived, and after lunch of course, we broke out all the toys and finally gave Daniel his hands-on with the Canon EOS 6D Mark II. He found it well balanced and familiar in hand as a long-time Canon user. It’s noticeably rugged, something Daniel really values as a landscape photographer. Right away, he pointed out the Vari-angle touchscreen noting how much easier shot composition would be. Complementing the camera was the fast focusing Canon 16-35mm EFf/2.8L III USM, a wide angle favourite that saw the most use, and a trusty 24-70mm f/2.8 II work horse. 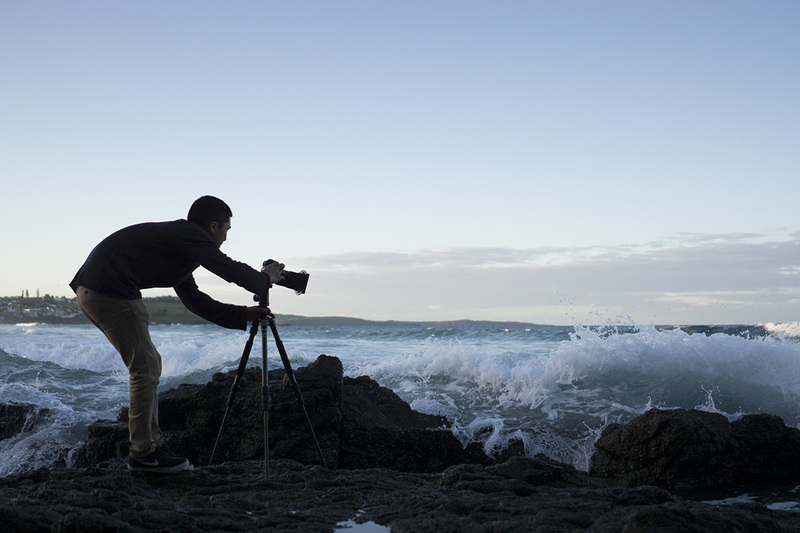 Eager to let the 6D Mark II run free, we headed down to the beach to find the best spot for a moody sunset. Standing in the line of fire and showing no fear of being drenched as the waves come in. Unlike the sandy beaches we’re used to, this one was made of battered stones and shells with the jagged spires of Cathedral Rocks looming in the distance. It was amazing. Standing on a precarious rock ledge, Daniel bravely set-up shop and started shooting. With the tide coming in, most of us tried not to get splashed, but he didn’t even flinch. Getting the right shot was more important than keeping his shoes dry. As we continued wandering, we spoke about the importance of timing, like reading the waves and knowing when to press the shutter. Having the right set of features on your camera can help immensely. This is where Canon’s fast and smooth Dual Pixel AF came into play, allowing Daniel to capture the waves rushing at him in quick, alarming detail. When the water got too close, we headed back to dry land for a low light portrait session while waiting for the sun to finish setting. We really wanted to push the 6DII by putting it through a range of scenarios to see how it handled the meagre amount of light we provided. Waiting for sundown, Daniel gets familiar with the Canon EOS 6D Mark II autofocus and lowlight settings. The portraits, done by a small campfire with heavily controlled lighting, turned out sharp and clear with beautiful colours and not much noise. The 6D Mark II was definitely showing off its work ethic. By now, the light had mostly faded, so we hurried back to our cars for a quick debrief before heading to our final destination; Bombo Headland Quarry. Though it was pitch black, this location was the highlight of the evening. An eerie quiet settled over our group as we moved through the quarry, dodging slabs of sandstone and clamouring over loose rocks. Armed with flashlights and stepping carefully, it felt like we were exploring another planet. It was perfect for the final part of our adventure; astrophotography. Looking up, the stars were bright and the Milky Way was visible even to the naked eye. We made base camp and got to work. 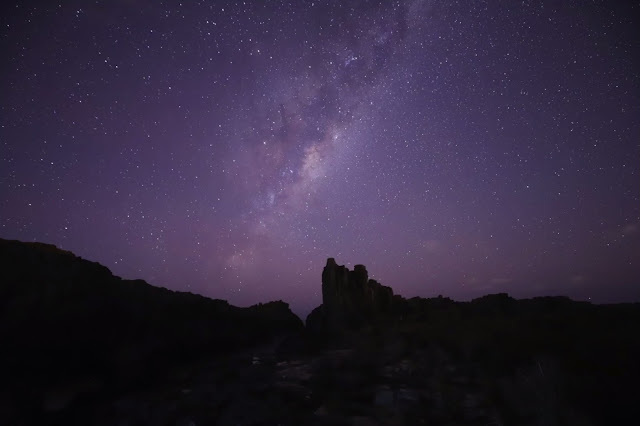 Gorgeously clear and vibrant shot of the Milky Way taken during the final part of our Day Out adventure. Having been to the quarry before, Daniel was clearly in his element photographing something so awe inspiring. The darkness meant he’d really have to bump the ISO, much more than the previous sunset and campfire sessions. 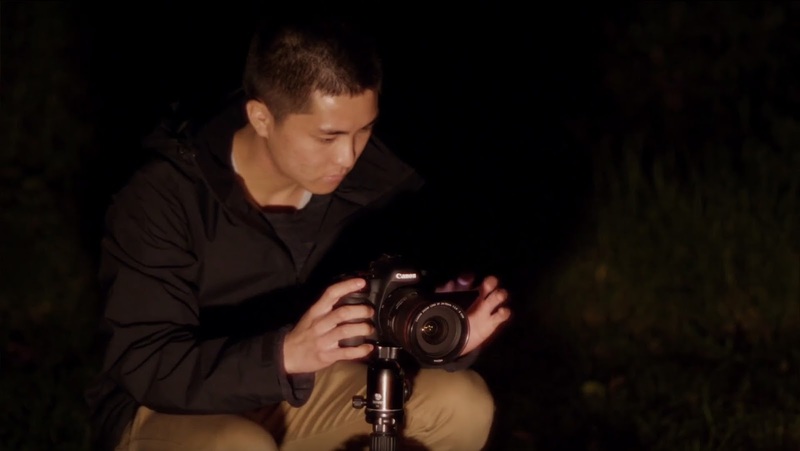 In a way, it felt like the first real test for the 6D Mark II. We learned a lot on this (very long) day out and we really put this camera through the ringer. It was threatened with sand, water, fire, and deprived of the one thing all cameras need; light. But it met our challenges head on and impressed us at every angle. Last week I had the opportunity to get my hands on the #canonaustralia #6DMarkII which just launched today. This is one of the shots that I captured at Bombo Quarry with the new camera at ISO6400. The result was a very clean image, I even pushed the ISO higher for some of the other shots. Extremely impressed at how well the camera handles low light situations. Click the link in my bio to find out more about the camera and what I thought of it. Also don't forget to watch the video 😜. • Huge thanks to @canonaustralia and @dcwarehouse for the amazing opportunity! With a seriously strong list of features and conveniences, the Canon EOS6D Mark II has proved itself to be a very worthy successor to the much-loved 6D. And from what we’ve seen so far, it looks set to become a new benchmark for low light photography.